Pereg Natural Foods (Pereg-gourmet.com) is a leading producer of premium, all natural pure spices and spice blends, among other flavorful products. While most people think of spices, seasonings and herbs as the substances that make our food taste good, these colorful ingredients also pack a nutritional punch. They are filled with an impressive list of phyto-nutrients, essential oils, antioxidants, minerals and vitamins that are essential for overall wellness. New Jersey based Pereg Natural Foods asked its resident spice expert – Joy – to give us her take on the 25 spices every kitchen must have to spice up your life, your recipes and your palate. She also offers some storage tips and info on uncommon spices, too. “It was hard to choose just 25 from among Pereg’s wide assortment of pure spices, but I whittled it down to 25 as the absolute must have spices for any kitchen,” Joy, of Pereg Natural Foods, said. When storing spices, your biggest enemies are: Air, Light, Humidity, and Heat. If you purchase spices in bulk, store them in an airtight container in the freezer. Store smaller quantities in a cool, dry place. Hilbeh - Also known as fenugreek, methya, menthya, vendayam, menthulu, uluva, uluhaal and methi. In Persia it is known as shanbalîleh. The name hilbeh is Arabic. It has a very light bitter and spicy taste (which might require getting used to). It is commonly used in Indian cuisine and is said to help improve digestion, increase libido, and treat hormonal disorders. Sumac - The sumac bush, native to the Middle East, produces deep red berries, which are dried and ground into coarse powder. Less commonly, the berries may also be sold whole. Ground sumac is a versatile spice with a tangy lemony flavor, although more balanced and less tart than lemon juice. A small sprinkle also adds a beautiful pop of color to any dish. Sumac is one of the main components in the spice mix za'atar. It's great over vegetables, grilled lamb, chicken and fish. Ground sumac also makes a nice, flavorful topping on dips like hummus. Sumac has been used across the globe for its medicinal properties and uses. Research has shown that health benefits of sumac are many, as it is naturally anti-fungal, anti-microbial, anti-oxidant and anti-inflammatory. Luisa Leaves - Luisa is sold under several names, the most common being lemon verbena. It can be found as prepared tea (bags), as loose tea, and as dried leaves. Luisa is believed to help one relax, aids in digestion, soothes menstrual pains and cramps and aids in kidney function. The leaves are used to add a lemon flavor to fish and poultry dishes, vegetable marinades, salad dressings, jams, puddings, Greek yogurt and beverages. It also is used to make herbal teas, or added to standard tea in place of actual lemon (as is common with Moroccan tea). It can also be used to make a sorbet. Some of the most expensive spices include saffron, machlab (common in Syrian cuisine), nutmeg, mace, cardamom, cloves and several types of pepper. Pereg was established in 1906, and is based in Clifton, NJ. They first became known for their vast variety of pure and natural spices and spice blends, more than 60 in all, from traditional favorites to exotics from around the culinary world. Today Pereg produces an array of all-natural products that includes ancient grains and ancient grain blends, gluten free pasta and cereal, a line of gluten-free flours, as well as couscous and quinoa in plain and blended varieties. 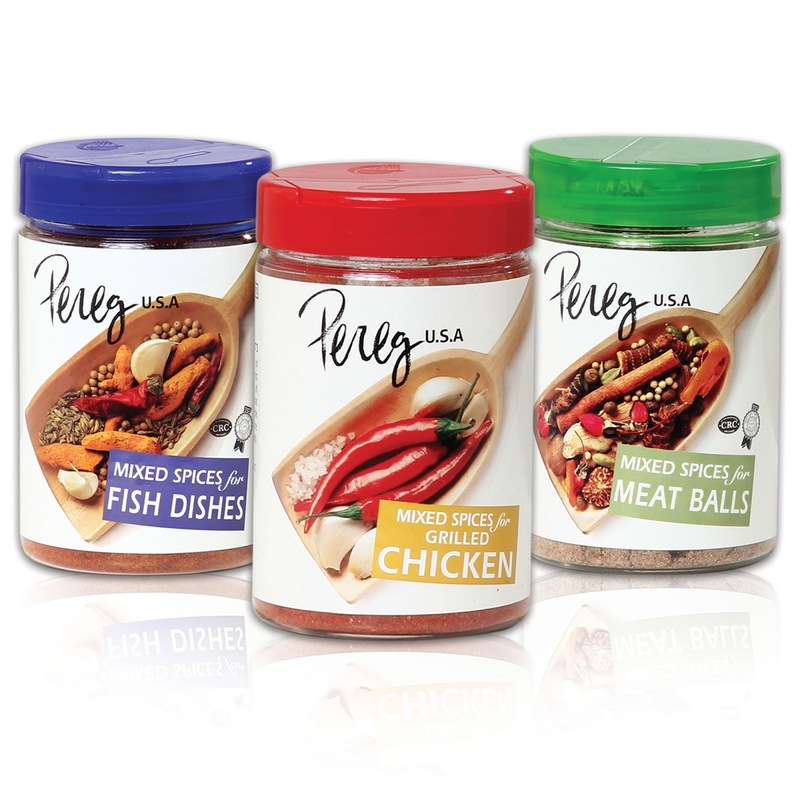 Pereg Natural Foods products are available at select retailers throughout the US and Canada, and on their website, pereg-gourmet.com. Pereg manufactures all its products from start to finish, controlling the quality from the sourcing until the product is packed and ready for the consumer. All Pereg products are kosher certified by both the Orthodox Union (OU) and CRC, are dairy and lactose-free as well as all natural, with no additives or preservatives. Many products are also certified gluten-free and non-GMO.